The warm summer weather often has homeowners thinking about making some positive changes to their houses. If you’re thinking about renovating, you’re not alone — a recent survey shows that about two-thirds of homeowners have plans to do some remodeling around their homes. But with big remodeling projects often comes complex electrical work. 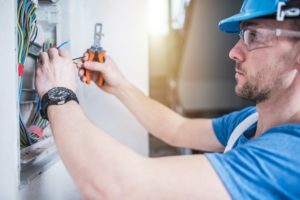 And while it may be tempting to do electrical work yourself, let’s take a look at a few reasons electrical tasks should be left to experienced general contractors. Promote safety: If you try to handle any electrical work by yourself, there is a risk that you can injure yourself. From getting electrocuted to starting a fire, there are a lot of things that could go wrong. This is why it’s best to leave the work to an expert during home remodeling projects. General contractors know the proper procedures to take to ensure they are being as safe as possible. And in doing this, they can keep your home and your family safe too. By having extensive safety training, contractors can not only get the job done right, but they can get it done safely. Use of knowledge: Home renovations can become pretty complex, especially when it comes to moving around electrical outlets and appliances. Fortunately, general contractors have the knowledge and experience to move things and hook electrical wires up correctly the first time around. If you try to do these tasks yourself, you may not get it right the first time — in fact, it may take several attempts before you get it right or give in and call a professional. So to save yourself the trouble and wasted time, hire a professional from the start. Compliance of regulations: Electrical work can go wrong in several ways, one of which is failing to meet certain rules and regulations. Electrical codes are in place to keep people safe in their homes and ensure everything is hooked up correctly. And unless you have training and experience, you won’t know what these rules and regulations are. But when you hire a contractor, you can rest assured that compliance with codes will be a top priority to keep you out of trouble and to keep your family safe. As you can see, hiring a general contractor for electrical work is always a great idea. If you want the job done safely, quickly, and correctly, leave the electrical tasks around your house to the professionals.